Blue Texels went under the hammer at Carlisle in the Sapphire sale, which saw a top price of 4,500gns achieved for a shearling gimmer from the Whatmore flock. 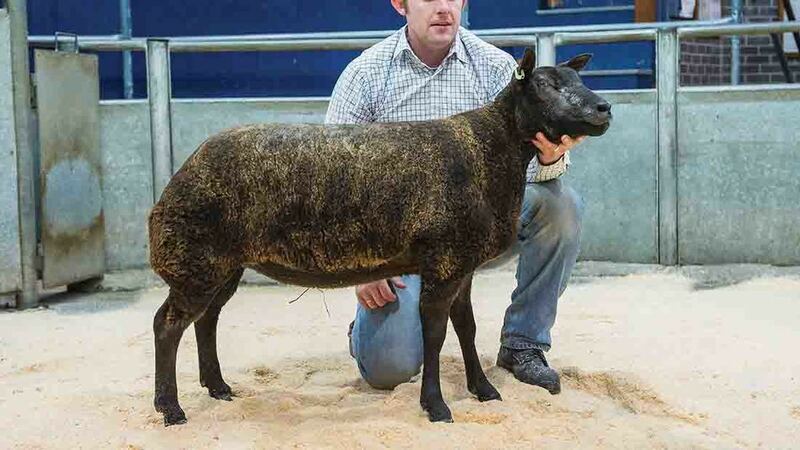 Whatmore Yawn, a shearling gimmer from Steve and Sara Gibbons sold for 4,500 gns. Consigned by Steve and Sara Gibbons, Brecon, Whatmore Yawn is by Whatmore Wasp and was sold with a service to Whatmore Yorkie. The buyer was A. Richardson, County Fermanagh. The Hackney flock from Paul Tippets and Christine Williams, Shifnal, Shropshire, sold two shearling gimmers at 2,500gns each. Hackney Yummy, with Hackney bred parents, sold with a service to Joes Alvin to R. Cooke, Abergavenny. The Whatmore Siren daughter Hackney Yosser had also been covered by Alvin, and found a new home with Cormack and McDowell, Billesdon, Leicester. The Whatmore stud continued their success, with another Wasp-sired shearling selling for 2,200gns. Whatmore Yeast sold with a covering by Yorkie, to H. Griffiths, Batley, West Yorkshire. Whatmore flock, 9 shearling gimmers, £1,636,83; Hackney flock, 8 shearling gimmers, £1,246.88; Jonsland flock, 5 shearling gimmers, £556.50; 6 ewe lambs, £346.50; Sams flock, 11 shearling gimmers, £630.95; 15 ewe lambs, £354.90.